Drone Industry Editorial, Outlook, Consulting and News expressed by Industry Participants and Leaders. Why are there so few negative reviews on drones and quadcopters? I’ve delved far enough into this endeavor to notice something which I have seen in MANY industries. That is, a lack of truly critical, negative and accurate reviews of many of the products! I could tell endless stories about this same tendency in other fields – for instance, I was in the heating equipment business for other 20 years and saw tens of thousands of customers buy things which were not suited to them…because marketing and sales efforts were a lot stronger than neutral and accurate information. A good part of my career was, and still is, spent in dispelling the myths and educating consumers about the realities of said products. Open a boating magazine and you are VERY unlikely to find negative reviews about boats. The same goes for a lot of other items – and the reason is usually very clear…..CONFLICT OF INTEREST. Boat magazines make their money from the very same manufacturers whose boats they review. It’s not a stretch to say that a negative review could lead directly to lost revenues and profits. This is the exact reason why Consumer Reports is a non-profit and accepts no advertising. It’s the only way you can even attempt to be neutral….but there is more! Not only does a review have to be neutral, but it also has to be accurate. Consumer Reports has millions of dollars in lab equipment which they use to actually measure quality, longevity and other metrics. If you’re a regular on this site, chances are you’re relatively new to multi-rotor RC flying. There’s a good chance you’re either brand new and just looking to get started, or are currently flying a toy grade quad such as an AR Drone, Hubsan, Ladybird, etc. If you’re part of the latter group, you’ve probably looked “over the fence” a few times and thought about moving on to bigger, “Hobby Grade” drones (for the purpose of this article, I will classify anything with brushed motors as toy grade, and anything using brushless motors as hobby grade). I know how you feel. I was there a year ago, flying my AR Drone and looking on with envious eyes at some of the things Juz and Alishanmao could do with their quads. I ultimately jumped over the fence, and I have to say it’s been quite a journey and learning experience. Along the way I’ve done some things right and some things wrong. The purpose of this article is to share what I’ve learned, and to help you be as prepared as possible when you’re ready to make the leap yourself. The Zen of Quadcopters – How Drones can put you in touch with nature! Am I going a bit too far in saying that quadcopters can lead to enlightenment, inner peace and a better world? It goes without saying these days – the subject of Drones come up, and some ill informed citizen will “drone” on about them being used for evil purposes. Having a narrow view of the world definitely keeps one from enlightenment, and the subject of unmanned flying machines is no exception. As the multirotor site “for the rest of us”, we determined that many of the online review and ratings for quadcopters are not suited to the average new consumer. Instead of using technical comparisons and subjective “feelings”, we determined that we would report the basics in a simple fashion which would help guide the buyer. For example, we will not have an rating as to value or durability in our official system for these reasons. Value is in the eye of the buyer and most modern Quads are exceptional in terms of the technology your money buys. So it goes without saying that the value is usually a good one! Durability is also based on many things, especially the experience of the operator. One good crash can destroy parts of any multirotor. Rather than rating these qualities, we will discuss them in the reviews and in the summary. This will quickly categorize the type of machine, so that prospective buyers know the target market. It also will indicate the size. Example: The Hubsan X4 is a “Consumer Micro”, which tells the reader it is very small (palm size) as well as not designed for any function other than hobbyists. It cannot easily be adapted for semi-pro uses, photography, etc. This will be stated as either a category of users or with a + sign, indicating that it may be suited for a range of users. Example: The same Hubsan X4 is rated “Advanced Beginners UP”, which indicates that all users other than beginners may find it an interesting product. On the other hand, we rate the WL Toys V959 as ONLY Advanced Beginners, meaning that it is unlikely to appeal to those who are much more expert. Beginners – never flown a quadcopter or less than 1 hour experience. Advanced Beginners – have already destroyed and repaired at least one quad and have 4+ hours (25+) flights. These users are confident they can fly in calm conditions and do some basic troubleshooting and repair if things should go wrong. Intermediates – have experience with a number of quadcopters and/or other R/C controlled aircraft and have full confidence in their ability to handle most reasonable conditions and controls. Experts – have years of experience and hundreds of hours of flight time on multiple quadcopters. These users are capable of virtually any modifications, assembly, repairs, etc. and are not worried even when they have $5,000 worth of quadcopter and camera aloft. We will also mention how well we think the product can handle a crash. This includes a number of factors, including how much it will cost to repair, how easy the repair is, and how likely it is that small crashes will result in big damage! It is unlikely that we will be testing any “Experts only” quadcopters as our budget does not allow for the purchase! However, who knows what the future will bring? We invite and welcome other writers and drone flyers to help us both here and on the forums! Please send a note by email to cissod@gmail.com if you have interest in writing or editing on the main blog. Every review will feature a short summary at the end of the page – this, when combined with the basic rating at the top of the article, should give you some idea if this is the drone for you! Reading the entire article and viewing the pics and the videos can then provide you with more exacting information and examples – both before and after your purchase. NOTE: Droneflyers.com does not represent any retailer, wholesaler or manufacturer of multirotor products, allowing us to give our true opinions! This is untrue of MANY of the other reviews, ratings and videos you will find on the subject. Free Consulting Advice for Chinese Quadcopter makers! Having been in marketing and sales for 30+ years, I get very frustrated watching the poor ways that Chinese quadcopter manufacturers present their products to the English speaking (and perhaps other languages) world. In the hopes of helping this industry to grow and prosper, I’m going to offer some free advice to the makers and marketers of these great products! 1. The poor web sites, instructions and other marketing materials. All of these combine together to create the wrong impression for this growing industry. I will try to be short and succinct so that this rant does not “drone” on for too long. Chinese representatives may want to have a professional translator present this (english) document to them so that they do not misunderstand either my motives or my criticisms. My motives are simple – purely to improve the appeal and reputation of the industry, and thereby create success for all involved. A. Lack of Speed – Almost without exception, the internet sites of the quadcopter makers are very slow. They are likely hosted in China and on shared servers, resulting in a lag time when loading from North America or Europe. Also, many of the site designs are not optimized for fast page loading. This results in a poor experience for consumers or dealers looking for information on the products. B. Lack of Clarity – Many of the makers of quadcopters also make many other products in the toy category. It is often difficult to navigate through the large sites and find the products which are important to the new quadcopter market. Even when the products are found, the pages often have a lack of specific information about the products. There is no excuse for these typos and the poor use of words. Chinese makers should study the web sites of Japanese companies like Epson, Canon and others to see how it should properly be done. 2. Company, Division and Product Naming – Here is the problem in a nutshell – the current generation of quadcopters are sophisticated aerial vehicles chock full of technology. Proper marketing would dictate that these not be called “toys” nor be sold by companies with “toys” in their names! It would be very simple for such companies to rename a small division in such a way that the product seems to have more value. After all, a “toy” is worth much less than an “advanced computerized aerial vehicle” or “unmanned aerial vehicle”, etc. Also, it is probably time to stop naming particular quadcopters with the word “UFO” in the name – or naming them after insects! Once again, the “toy” meme makes a product lower in the eyes of most western consumers. 3. Aesthetic design of the finished products and boxes – This is also somewhat related to #2 above. 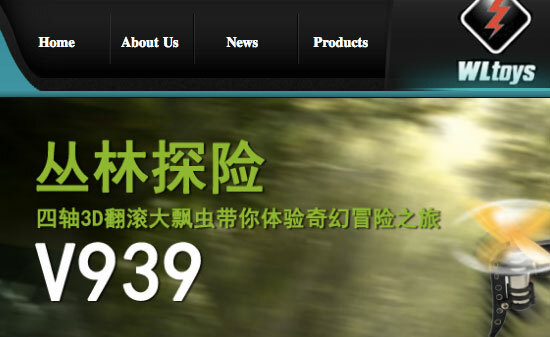 Manufacturers in China make an advanced product at an amazing price – high technology bargains! Then, they put shells on which make a grown man wince! NO, I don’t want a piece of technology that looks like a dragon, a bug or a spaceship with a man in it! I want technology where the form follows the function. Do some market research and find out the average age of the NEW buyers of these quadcopters – my guess is that you will find the age to be much older than your guess! Design the products for the consumers who are buying them! As an example, let me take the Syma XI, a fine bargain quadcopter. It is available with a spaceship, a UFO and a bug cowl. So, what would I suggest? What would be better? I think a clear canopy would be great. Or, one designed for ADULT tastes, using professional artists familiar with western tastes. 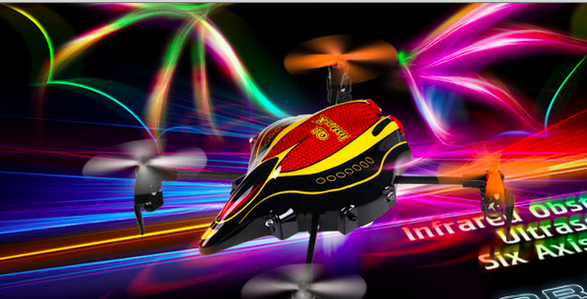 To illustrate this point, note this picture of the Walkera infrared Quadcopter…..it looks like a Chinese street festival. I mean no disrespect to Chinese celebrations, which I am certain are very exciting! However, this is not a parade – this is a high technology product with obstacle avoidance and many other advanced systems. While I could say more, I feel that the above represents the bulk of the problems with the current presentation and marketing of the Chinese products. I hope that I have not insulted any of my dear readers with this advice, however please accept my apologies if this is so. I have written this only in the spirit of achieving success for all involved in this growing and dynamic industry. You can choose to listen – or you can ignore my advice! Notice that the web site speaks to a more mature reader and features instructive videos and other guides. Note – although I am semi-retired, I would consider doing some limited consulting work if any are interested. Please email cissod@gmail.com if you would like to contact the author. Note – the conversation and advice will continue in this thread over in our forums. 1. It was thought that the human body would suffer great damages if it ever went much over 40 MPH in a train. 2. Cars were lamented because of the damage to the horse trade – all those people would be unemployed.